Captain Lucy Chacha’s experience with female genital mutilation is fueling her dream to end the cultural practice in the Mara Region of Tanzania. 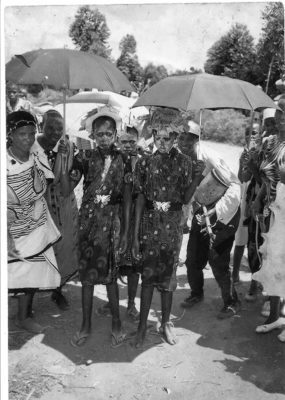 Lucy Chacha and her twin sister on the day they underwent female genital mutilation at 14, with blood visible on their dresses and the traditional white paint applied to their faces following the procedure. The two women pictured on the left held the girls down while being cut and made sure they made it home. Way up in the north east of Tanzania lies the Mara Region, home to the world-renowned Serengeti National Park, where millions of people from all over the world come to witness the grandeur and beauty of rural Africa, the ancient wildebeest migration, and see scores of African wildlife in their natural habitat. Mara Region is also home to Captain Lucy Chacha, the third child of nine but the first of twins. Born in 1978, she enjoyed a happy childhood steeped in the beautiful culture and strength of her native Kuria tribe. But like most cultures, among the good are found cultural practices and activities that are not good, and some in fact, which are harmful. In her tribe, female genital mutilation (FGM, or “Ukeketaji” in Kiswahili) is still widely practiced. As a cultural rite of passage, girls between the ages of 10 and 20 are sent to undergo this cutting and return home to gifts of money, “Vitenge” (African textile/wraps) and hearty congratulations. Thereafter, many will end their formal education and be married. When Chacha was 14, her family prepared to send her and her twin to undergo FGM. She told her parents she did not want to undergo this practice, but she was told she must go; there were no other options. In keeping with culture and tradition, she was threatened with stories that if she refused, someone in her family would die, and she would be chased away from her society. “In those days, there were no institutions or churches which would help girls who did not want to be cut and there was no one to defend our rights,” she said. Though it was against her will, she found no alternative. On Dec. 12, 1992, Chacha and her sister experienced FGM. Not only did Chacha find the procedure to be excruciating, but her distress grew when she came to find out that several of the other girls lost their lives that day due to uncontrolled bleeding. Her own sister lost so much blood from the procedure that she became unconscious for a while, pushing Chacha’s traumatized spirit to the limit. Local medicine revived the sister and the girls were able to finish the last part of their rite of passage, leaving the camp with a joyful entourage and walking the 6.2 miles back to their village without crying or showing any signs of pain. 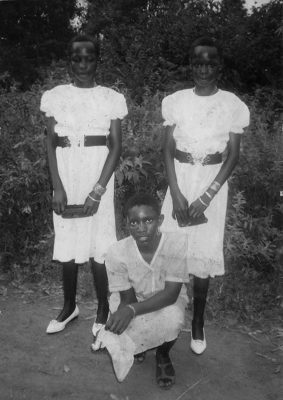 Lucy Chacha (right) with her twin sister two weeks after they experienced female genital mutilation. As such, they were then considered “young ladies,” eligible for marriage in their tribe. Paul reminds us that there is hope in Romans 8:28: And we know that in all things God works for the good of those who love him, who have been called according to his purpose. In The Salvation Army, we wholeheartedly believe that God delights in taking our trials to turn them into testimonies. He so often takes our scary and sorrowful situations and turns them into stories of hope for others. Though her life was physically and emotionally altered by FGM, Chacha praises God that he also had a life-changing plan in her future to use her story for his glory. When she was 17, Chacha was married to Lucas Chacha, who turned out to be a wonderful husband and friend, as well as a partner in following God’s call to ministry in The Salvation Army. The pair left their village in 2002 and began their journey by entering the Officer’s Training College in Dar es Salaam. In December 2015, after many years in ministry, a day came when Chacha found herself in Nairobi at a Faith Based Facilitation Seminar listening to Territorial Commander Commissioner Vinece Chigariro speak. In her message, the commissioner challenged the delegates to look at their lives and ministry and ask the question: What have you done in your societies to make a change? “Though I have always deeply remembered my experience with FGM and wished I could do something about it, I could only answer honestly that I had done absolutely nothing to make a change in my home society,” Chacha said. That very week, she made the commitment to do something for her people about FGM and early marriages. God gave her the courage to begin using her story by doing something that would lead to change for the next generation of girls. Coming back to the Tanzania Territory, Chacha—now Extension Training Officer and Associate Territory Youth Officer—shared her story with the leadership and a dream was born to help end the practice of FGM in the Mara Region, where The Salvation Army has two divisions. The Women’s Ministries Department committed to leading this ministry, but gladly acknowledges that it is widely supported by all sections of the territory. We began with prayer, then saturating the territory with our story, and teaching and inviting all Salvationists to engage in the process of bringing an end to this practice. In March 2016, during Easter weekend, with over 1,200 Salvationists present in Tarime, the message was delivered: FGM was not a practice that honors God, values girls and women and is certainly not a cultural practice that The Salvation Army condones. Today, Captain Lucy Chacha, Tanzania Territory Extension Training Officer and Associate Territory Youth Officer, dreams of eliminating the cultural practice of female genital mutilation for the next generation of girls. She is leading the charge to make that happen through education and a safe house through The Salvation Army. Following Easter weekend, our newly formed committee of 25 people spent two weeks going house to house to take a survey to help determine the best way forward in the eradication of this practice, first within our church and second throughout the communities of Mara Region. A baseline survey was created and three nuggets of wisdom were harvested. First, the need to saturate the region to sensitize every level of society with understanding of FGM and to teach the truth about it. Second, to offer a safe house where girls who do not have the support of family can flee in the cutting season and find advocacy, safety and legal support. Third, advocacy for girls in education and vocational skills training and reading and writing classes for girls who are too old to continue in government schools but need an alternative to an early marriage. What began in Chacha’s life as a traumatic experience has been set free from its silent cell, and is now beginning to make a difference to her people. Throughout the winter cutting season and beyond, we will do what we can to help others by raising our voice against FGM, early marriages and other forms of injustices toward girls. Salvationists are promising not to engage in the practice of FGM, young men are promising that they will only marry “uncut” girls, training material in the shape of A3 teaching charts are being created and used, seminars and sensitization continues, and the word is getting out to girls that they don’t have to go through FGM. Now, there are advocates ready to support them. We are now, by faith working toward phase two: a safe house for girls with a comprehensive legal plan to protect girls who flee FGM, working with families to end the cultural practice and develop a skills training program for those unable to re-enter school. The Salvation Army was given land for the safe house and is raising funds for construction and ongoing training. Everyone has a story that God wants to use for his glory to make a difference. Join us in Tanzania by thanking God for his life-changing work in Chacha’s life, and say a prayer for our success in the eradication of FGM in the Mara Region. Support the campaign against female genital mutilation through The Salvation Army at salar.my/tanzaniaproject. 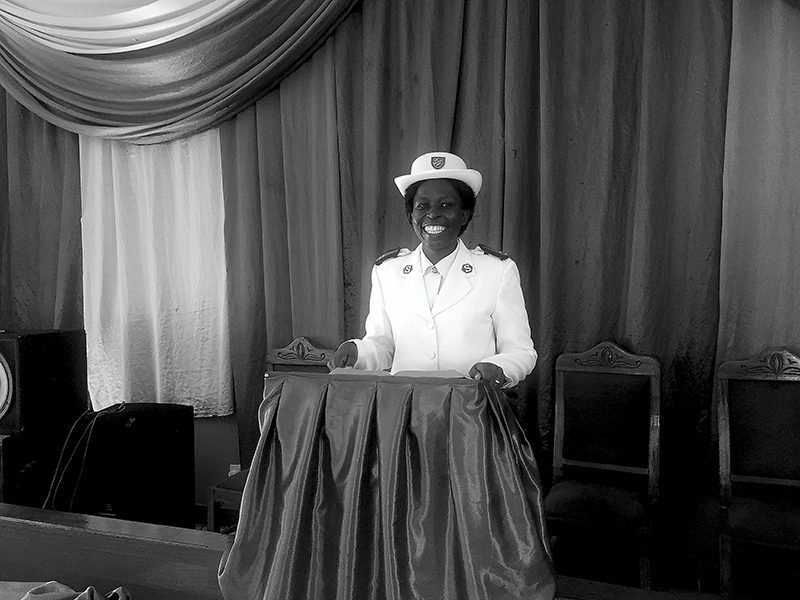 Colonel Debbie Horwood is the Territorial President of Women’s Ministries in The Salvation Army Tanzania Territory. Why do we still put out the kettles?